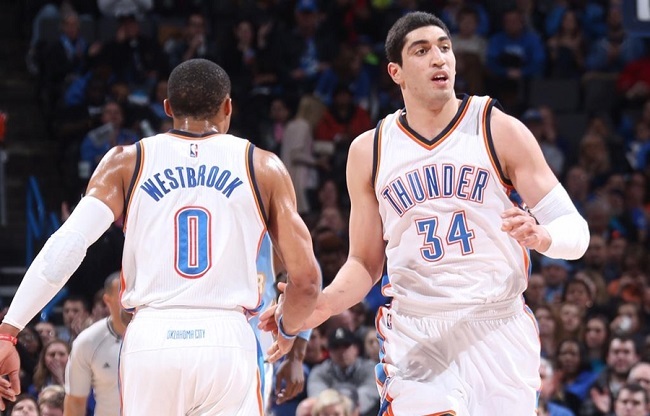 Enes Kanter (right) averaged 18.7 points and 11 rebounds for the Thunder last season. After coming to the Oklahoma City Thunder in a midseason trade from the Utah Jazz, Enes Kanter looked every bit like the dominant seven-footer many predicted he’d be when he first entered the NBA as the No. 3 overall pick in the 2011 draft. In 26 games with the Thunder, Kanter averaged 18.7 points and 11.0 rebounds, connecting on 56.6 percent of his shots from the field. It was a marked improvement from his final half-season with the Jazz (the team that drafted him), in which Kanter averaged 13.8 points and 7.8 rebounds on 49.1 percent shooting. Although the Thunder fell short of the playoffs on the final day of the regular season, Kanter flashed enough production — and perhaps more importantly, enough potential — to make him on the league’s most coveted free agents going into the offseason. The NBA’s summer signing and trading period is not over yet, but the bulk of the league’s top available players have either found new homes or re-signed with their current clubs. LeBron James is back in Cleveland. LaMarcus Aldridge has moved on to San Antonio. DeAndre Jordan almost went to Dallas before changing his mind at the last minute and re-signing with the Los Angeles Clippers. For the NBA’s small community of Muslim players, it has been an active offseason as well. While Kanter, Omer Asik and Al-Farouq Aminu were looking for lucrative new deals as free agents, players already under contract like Dion Waiters and Kenneth Faried sweated out trade rumors, and others like Jusuf Nurkic and Gorgui Dieng faced recovery and rehab from injuries suffered late in the season. Furkan Aldemir: If his performance in the NBA summer league is any indication, Aldemir is going to find his niche in the league as a rebounder and defender. The 6-foot-10 power forward from Turkey didn’t play a whole lot in his rookie season with the Philadelphia 76ers, but with the Sixers’ summer-league squad he’s averaged 13.3 rebounds and 2.7 blocks per game. Al-Farouq Aminu: Signed with the Portland Trail Blazers for $30 million over four years. Just 24 years old, Aminu is already on his fourth NBA team going into his sixth pro season. This time, however, it seems the 6-9 small forward has found a spot where he can settle into some semblance of stability. Aminu was a key contributor off the bench during the Dallas Mavericks’ playoff run last season with his rebounding, defense and fast-break finishes. But with the Blazers in rebuilding mode after losing several starters to free agency and trades, Aminu has a clear path to earn a starting role in Portland. Omer Asik: Re-signed with the New Orleans Pelicans for $58 million over five years. With Asik anchoring the middle, superstar power forward Anthony Davis is free to roam the entire court like the updated version of Kevin Garnett he was meant to be. After backing up All-Star centers Joakim Noah (Chicago) and Dwight Howard (Houston) in his previous NBA stops, Asik has found his home in New Orleans. Gorgui Dieng: The former first-round draft pick and NCAA champion at Louisville has the skills to be an NBA starting center — he averaged 10.8 points, 8.8 rebounds and 2.0 blocks in 49 starts last season — but Dieng may not get another chance to start for the Minnesota Timberwolves after the team used the No. 1 overall pick in this year’s draft on Kentucky phenom Karl-Anthony Towns. Dieng missed the last nine games of last season with a concussion, but has recovered and is playing for the Senegalese national team this summer. Kenneth Faried: Less than a year removed from signing a $48 million contract extension with the Denver Nuggets and helping Team USA win gold at the FIBA World Cup, “The Manimal” still can’t shake the trade rumors surrounding him. The Nuggets hired a new head coach this offseason, Mike Malone, and he sounds like a fan of Faried’s, which bodes well for the 25-year-old power forward. “He brings it every night,” Malone said of Faried. “There’s not many guys like that.” Malone wants the Nuggets to be an up-tempo team, which well suits the skill set of Faried, who averaged 12.6 points and 8.9 rebounds last season. Ersan Ilyasova: Traded to the Detroit Pistons from the Milwaukee Bucks. A part-time starter for the Bucks during the regular season, Ilyasova started each of Milwaukee’s six playoff games before the team was eliminated by the Chicago Bulls. But the Bucks needed to shed salary in order to re-sign guard Khris Middleton and make a play for a big-name free agent (they eventually signed former Pistons forward Greg Monroe), so Ilyasova was dealt away. In Detroit, he projects as an outside-shooting “stretch four” power forward who will complement young center Andre Drummond. Enes Kanter: Re-signed with the Oklahoma City Thunder for $70 million over four years. As a restricted free agent, Kanter could sign an offer sheet from any team, but his current team (OKC) would have three days to match the offer and retain him. The Portland Trail Blazers were willing to ante up a maximum salary (given Kanter’s experience) for the seven-footer, but the Thunder surprised many by matching the offer to keep Kanter. Nazr Mohammed: Looking to return for his 18th NBA season, the 37-year-old Mohammed is still available on the free-agent market. He played sparingly for the Chicago Bulls the last three seasons, but was a crowd favorite and respected locker-room leader for his hometown squad. I wouldn’t be surprised if Mohammed is still unsigned going into training camp, but I also wouldn’t be surprised if a playoff contender in need of frontcourt depth picks him up during the season for his experience, toughness and veteran leadership. Jusuf Nurkic averaged 6.9 points as a rookie. Jusuf Nurkic: Despite suffering an ankle sprain in March that caused him to miss eight games, and playing the remainder of his rookie year with the Nuggets on a left knee that required offseason surgery, Nurkic was still good enough to average 6.9 points and 6.2 rebounds, as well as drop a season-high 17 points in the final game of the regular season. Assuming he makes a full recovery, the 6-foot-11 center from Bosnia is projected to be Denver’s starting center next season. Dennis Schroder: The Atlanta Hawks’ backcourt became a little more crowded with the offseason additions of Tim Hardaway Jr. (son of retired All-Star point guard Tim Sr.) and Justin Holiday (brother of active former All-Star PG Jrue), but Schroder should still retain his spot as the primary backup to Atlanta’s reigning All-Star PG Jeff Teague. Schroder averaged 9.0 points and 3.9 assists during the Hawks’ postseason run to the Eastern Conference Finals. Mirza Teletovic: Signed a one-year contract with the Phoenix Suns for $5.5 million. Teletovic is a shooter, and the Suns like shooters. The 6-9 forward from Bosnia missed three months last season with the Brooklyn Nets after being diagnosed with blood clots on his lungs, but surprisingly returned for the playoffs, where he saw spot duty in the Nets’ first-round loss to the Hawks. Teletovic is heading to a Suns’ team that hasn’t been to the playoffs in five years and is constantly trying to recapture the explosive offense it had during the Steve Nash, Shawn Marion and Amar’e Stoudemire era. Hedo Turkoglu: The 6-10 small forward can shoot, handle and pass the ball, but at 36 years old he may have a hard time catching on with a team before training camo. Last season with the Clippers he averaged 11 minutes off the bench in the regular season, but saw that time cut in half during the playoffs. Dion Waiters: Scapegoated and shipped out of Cleveland midway through last season, Waiters was supposed to thrive in Oklahoma City with a green light to be the third scorer the Thunder needed alongside Kevin Durant and Russell Westbrook. Waiters averaged 12.7 points for OKC, but his numbers were mostly the same across the board from his numbers with the Cavaliers, and the same flaws that earned him a bad rap in Cleveland didn’t disappear with the trade. There was speculation that OKC would be looking to trade Waiters this summer, but he’s still on the roster and the Thunder didn’t use either of their draft picks or free agency money on shooting guards to push Waiters for minutes.